The mute swan is annoyed, to say the least. Though in fairness to the animal, no one enjoys having a feeding tube shoved down their throat, regardless of how necessary or lifesaving the procedure. 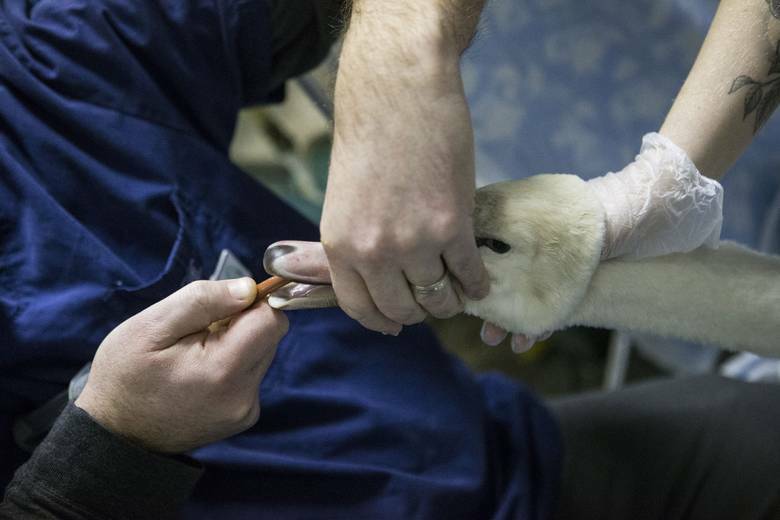 “Wow, she’s strong,” says a staff member at the Toronto Wildlife Centre who’s trying to hold the struggling swan while rehabilitation manager Aaron Archer squirts another syringe of blended green goop down the bird’s outstretched gullet. Soon the feeding is over and the swan is swimming contentedly in a large plastic pool, although still eyeing Mr. Archer suspiciously. “When she came in she couldn’t stand,” Mr. Archer explains as he fills out the grumpy patient’s chart. “Letting her swim around takes the weight off her legs, and allows her to regain some strength.” She’ll spend most of her day in the pool. The brutal cold snap that kicked off this winter in Toronto took its toll on more than just people. Along with the swan, the Toronto Wildlife Centre has taken in some 30 bats, a whole bunch of frostbitten opossums, a northern shrike with a busted wing and hundreds of other sick or injured animals in the past few months alone. “When the weather gets very, very cold in the wintertime, a couple of things start to happen,” the centre’s executive director, Nathalie Karvonen, explained. “One is that the Great Lakes start freezing over, which is really bad for water birds,” she said. “Water birds need water, not ice. Ms. Karvonen said the number of admissions is only slightly above normal for this winter, in part because of the reprieve brought on by the recent warmer weather at the end of January. Even so, they’ve had an unusually high number of snowy owls come in – eight so far this year – something that often points to struggles the birds are facing farther north. “Really, they are Arctic birds. They are meant to be much farther north. They’re happy in freezing cold temperatures,” Ms. Karvonen said. “Typically when we see them coming this far south it’s because something has happened with their food source. By the time they get here, they’re usually weak and starving,” she said. That was the case for one female owl who’s currently in care at the centre. She was admitted in late January after being found stranded on Highway 400 surrounded by traffic and unable to fly. Like most animals that are brought to the centre, whether by the public or by the centre’s rescue teams, who often get called out for more difficult retrievals, the owl underwent a full medical exam, including X-rays and blood work. Thankfully, she had no broken bones, but there was a lot of soft tissue damage and blood hemorrhaging in her eyes – indications she suffered some sort of trauma, likely from being hit by a car given where she was found. Under the medical guidance of veterinarian Diana Sinclair, the rehab team worked out a plan to help get the owl healed up and back into the wild. Her treatment is going well, Ms. Sinclair said, and while it’s likely she will be successfully released, it’s too soon to say exactly when. Ms. Karvonen says in the winter they often have to hold animals until the spring arrives and it’s safe to release them. In the centre’s 25-year history, they’ve admitted more than 100,000 different animals, covering roughly 270 different species. No one knows for certain how low Toronto’s temperatures will drop in the coming weeks, but Ms. Karvonen said the larger concerns for her centre is funding. The centre relies 100 per cent on donations, and another cold snap could stretch things tight again. “We always worry on a daily basis about what the outside environment is going to bring us. If there is another period of prolonged cold, that will mean a lot of repercussions for us,” Ms. Karvonen said.